Is Tiscali's on-demand service as comprehensive as it is easy to use? Tiscali has a triple-tuner PVR to match that offered by Virgin Media, but although Tiscali+ is capable of receiving HD broadcasts, none is available due to current limitations on network bandwidth (a situation which also applies in part to BT's Vision service). A free seven-day catch-up service is available, featuring the most popular programmes from BBC, Channel 4 and FX. The remaining VoD services you receive depend on which 'mix' you add to your package (costing £6 a month). Entertainment Xtra gets you National Geographic, 4oD, Screen Gems, HBO, CNN, Warner Brothers TV and C1 (archive shows including Little Britain and Desperate Housewives). The music mix gets you videos on demand. Around 7,000 music videos from the last few decades can be viewed. These are divided into 11 V:Mix 'channels' or you can create your own channel (essentially a favourites list) and the kids' mix features Scamp (which is controllable using a child-friendly remote) and Cartoon Network Now. Films are offered for rent from Tiscali Movies, ranging from £1.99 for classics to £3.75 for new releases. These can be viewed as many times as you like in 24 hours. You can search for them A-Z or by actor. Alternatively, you can supplement your subscription to get films from Sky Movies at £21.50/month or pay £5 monthly to watch unlimited films from Picturebox (from the Universal stable) or Disney Cinemagic. Free VoD films are provided by Movies Now and Film 4. 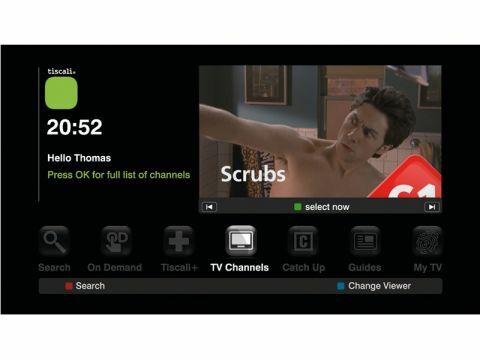 With a recently overhauled and very accessible interface, Tiscali TV has a formidable amount of viewing on offer, albeit with the notable exceptions of an ITV catch-up service and high-definition programming.